Detox products: 12 Drug Test Kit. Pass drug tests, passing all drug test. 12 Drug Dip Panel Test is testing for: COC, THC, OPI, AMP, mAMP, PCP, BZO, BAR, MTD, MDMA, OXY, PPX and their metabolites. 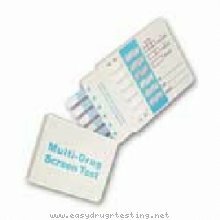 1 - 9 Tests $7.20 ea. 10 - 24 Tests $6.95 ea.